This podcast takes care of those who often requested to hear Pink Floyd’s free concert staged on a huge barge, moored off the Piazza San Marco, Venice, Italy in front of an estimated crowd of 200,000 people. The concert was broadcast to over twenty countries and was seen by over 100 million people. This concert was perhaps one of the more controversial ones for Pink Floyd. The concert was almost canceled for fear that the vibrations of sound from such an event would damage some of the buildings. Despite Floyd performing at a lower volume, there was still claims of damage to some buildings and many lamp posts were destroyed from fans climbing on them to get a better look. Even worse, the city failed to provide the necessary amenities for the fans. This lead to 300 tons of trash, and human waste being left behind which the Italian Army had to clean up. 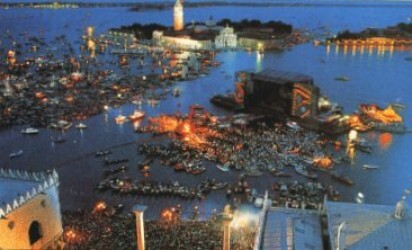 The Venice City Council later apologized to the residents and vowed that no similar concert would be allowed again. The first few songs are included to give you enough time to chill and roll a few good spliffs before we dive into the concert portion. This entry was posted in 1989-90 Another Lapse Tour by Doc. Bookmark the permalink.